You are invited to visit the gallery at the Worumba Homestead if you are staying at the Quarters, going on the track or are travelling in the area and enjoy visiting and looking at Art Galleries. The small gallery of paintings in various media is in the hallway of the homestead with the studio adjacent to it- where you can usually see pictures being created. Please phone us before coming out because it is a long drive out if no one should be home. Lindsay is a 4th generation grazier in the Cradock/Hawker district. After owning and working several properties with his brother and sons in 3 different states, he has chosen to retire and spend his later years on the beautiful property of Worumba where he and his wife Mary have the best of both worlds. While continuing to run Worumba as a pastoral property they have also diversified into tourism. 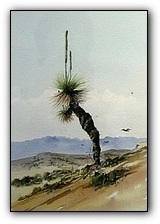 The beauty and tranquillity of the Worumba Station has encouraged and inspired Mary to develop her hobby of painting into a serious pursuit..
After completing degrees in psychology and dentistry in the United States, Mary Clock worked as a resident dentist on the Navajo Indian Reservation in Arizona. From that she acquired her appreciation of semi-arid land photography. After 10 years in private dental practice in Tulsa, Oklahoma, she embarked on a two year around the world experience. In 1987, she married Lindsay Clarke and settled with him on Worumba Station in the Flinders Ranges of South Australia. She quickly became familiar with life on the station and took up landscape painting. Mary is mostly a self-taught artist, painting the ever-changing beauty that surrounds her. Her time is now divided between helping to run the station and managing the family home. She follows her passion for landscape painting when time permits. The Clock-Clarke Gallery, established, owned and operated by Mary and Lindsay, is only open by appointment. Access to the property and the gallery is dependent on the condition of the dirt road to Worumba and the workload on the property.